Welcome to my review/ rant for this anime! If you're looking for an amazing reverse harem, please save a few of your brain cells by not watching Diabolik Lovers. If you're into watching men be total douchebags to women or like seeing women being way too submissive, this anime is right up your alley. To the rest of the world, save yourself some time and don't bother entering what I like to call "the dark side of anime." I got a few responses that Diabolik Lovers was a great place to start if I wanted to see a bad anime. So that's what I decided to watch. And bruh..... I swear I wanted to vomit after the first episode and I shed a tear is disbelief when I checked the listing for Fall 2015 and Diabolik Lovers got a second season. 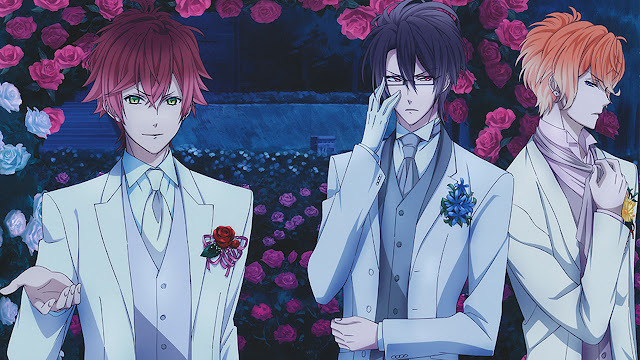 The only thing I can "praise" Diabolik Lovers for is the animation; but don't be fooled. It gives off this beautiful victorian air that was utterly ruined by the rest of the portions of the anime. And as for the music... I did not even care for it since the animation and music was not even close to enough to save this anime from the despair it dug itself into. Diabolik Lovers is about a human girl named Yui who unknowingly ends up walking into a mansion filled with vampires. These vampires aren't your modern day vampires like the ones you see on Shitlight ahem ahem... I mean Twilight. No... on the contrary these are masochistic vampires who enjoy preying on the indefensible Yui who for some reason cannot leave this vampire infested mansion. Besides the terrible plot, the other main problem most people find atrocious about the anime are the characters. First up we have the only human in the anime, Yui Komori. I think what most people disliked about her is the fact that she was way too submissive; I mean if you're getting attacked by vampires don't you want to at least resist a bit? Not even just a little? Then we have the vampires. All of them are total douchebags towards Yui the moment they are all introduced to her within the first episode. Whenever I saw a glimpse of hope that the vampires actually have a likeable side to them when conversing with Yui, that hope is crushed in a few seconds when they make a complete 180 personality change and they're back to being the diabolic trash that they are. That's it and there's not much left to say, I'd just highly recommend the mentally sane people to stay away from Diabolik Lovers. If you want to see an terrible anime for the sake of seeing a terrible anime, by far be my guest, Diabolik Lovers is the way to go. There are so many reverse harems that are by far better than this like Akatsuki no Yona for example. The crazy fanbase for this anime is something that baffles me. This anime truly lives up to its name on its use of the play on words of "diabolic." How the manga turned into an anime? I don't know. Like bruh... the fact that Diabolik Lovers got a second season might send me to the ER soon. "The oldest of these brothers, Shū, treats Yui like she is nothing to him as food. He refuses to call her by her name, treats her like nothing, and dehumanizes her. The second eldest brother, Reiji, has famously given Yui a cup off drugged tea and verbally and physically abused her when she dropped her teacup after passing out. The next in the line of brother, Laito, is a sexual abuser who believes love only comes in the form of lust; it is heavily implied he raped Yui. Kanato is the next brother; he is mentally unstable and manipulative. Kanato has admitted that Yui would be prettier dead and in one scene nearly succeeded in strangling the life out of Yui. Ayato, the brother after Kanato, is a misogynist; he treats Yui like a slave by ordering her to cook for him and throws Yui into a pool when she tries to refuse, despite the fact that she can not swim. Subaro is the youngest brother, and the nicest. Subaro will yell and break furniture when he is mad, often terrifying Yui into submission; but he has been the only on to treat her like a human and once tried to help Yui escape the six brothers." Thanks for reading, sorry for the late reply, and thank you for the lengthy reply. I agree, it's not the best anime by far - and looking back now my distaste for it has grown even more due to climate we're in today.